TUCSON (February 21, 2018) — FC Tucson announced today it had named David Cosgrove as the club’s new head coach. Cosgrove is the men’s head coach at Pima Community College and is the school’s all-time leader in wins during his tenure (1999-2017). 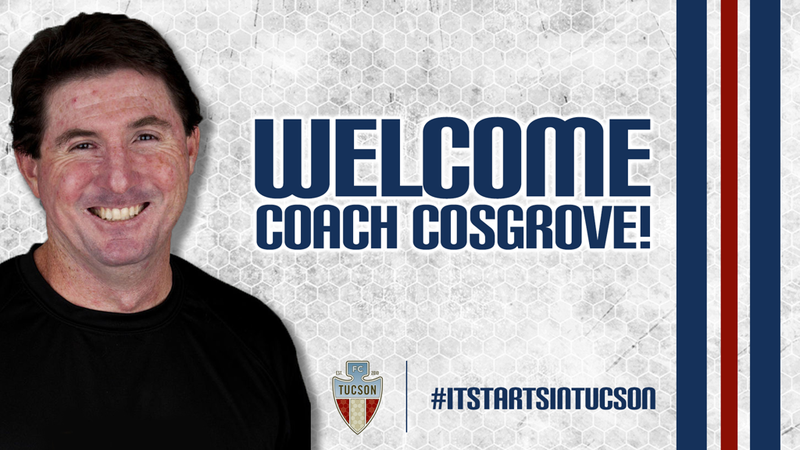 Cosgrove is also the director of coaching and a board member at Tucson Soccer Academy. Cosgrove is the third head coach in club history, following in the footsteps of Jon Pearlman and Rick Schantz. Cosgrove will remain at his positions with TSA and Pima Comunity College. FC Tucson begins the 2018 season at home on May 12 against Albuquerque Sol FC. Fans can still purchase FC Tucson season ticket packages starting at just $65. Season ticket packages include a 2018 FC Tucson scarf and merchandise discounts! Fans interested in becoming season ticket members can head to the club’s website at www.FCTucson.com. FC Tucson, established in 2010, is committed to bringing the highest caliber of collegiate soccer to Tucson and establishing a successful and long-lasting source of pride for city, county, state and country. In 2012, FC Tucson was named the PDL Rookie Franchise of the Year. For more information about FC Tucson, visit Fctucson.com. You can also follow the team on Facebook (FCTUCSON) and Twitter (@FCTucson).